Every year sushi lovers enjoy their favorite holiday, International Sushi Day, that is celebrated on June 18. Although this is unofficial holiday, it attracts millions of people around the world! The history of this holiday is rather simple and it has nothing to do with some certain offline event held in Japan or anywhere else in the world. In 2009 a guy named Chis DeMay created a Facebook Fanpage of sushi, and that page immediately attracted many sushi fans around the world. DeMay decided to start International Sushi Day on June 18 tagging it with the statement “Every day should be Sushi day, but like anything that is this amazing, it deserves a day unto itself”. the perfect amount of rice for sushi is as much as you can roll into a ball with one hand. 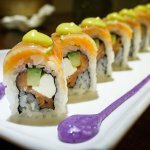 Remember these tips and your sushi will always look like from a restaurant!